It’s Sunday afternoon but there’s no rest for the wicked! I’m en-route to Derby for a night in a hotel before an early morning commission and an appointment with a Government Minister. These short December days make it feel far later than it really is. As I type this on my phone I was surprised to see the time in the corner of the screen only showing 16:40. I’m on a Grand Central service that was going to take me to Wakefield for an onward connection to Derby, but (surprise surprise) it’s been delayed by other late running trains, so I’ll miss my connection. Instead I’m going to stay on this train and go via Doncaster and Sheffield before heading down to Derby. This service (the 16:14 off Halifax) is actually quite quiet, which makes a change! I normally struggle to get a seat on GC services nowadays! What’s good about this train is that omits the stop at ‘Pontycarlo’ (as Ponfefract is often known) as we run via Hare Park Junction to gain the East Coast Main Line from Leeds, which speeds up the journey considerably as there’s no crawl along the normally freight only line from Knottingley. Luke, our Guard has just announced we’re stuck behind an all stations service into Doncaster, which means we’re already late (again). That went well! I stepped straight off the Grand Central service (which loads of passengers were joining) and crossed the platform to the bay where A rather special Pacer was waiting to head to Shefgield – the unique rebuilt 144012. On the move again after having a quick break in Sheffield between trains to grab a sandwich and a pint at the ‘tap. Now I’m on a packed East Midlands Trains Meridian. As is often the case, I’m stuck in a vestibule. It was quite amusing as a group of young football fans asked me to take a picture of them with somebody on one of their iPhones. I’d no idea who it was but apparently they’d me a football commentator on the train and he agreed to a picture with them. As I’m not a footie fan I wouldn’t know him from Adam (unless he was Gary Linaker) but they were well happy and he seemed quite pleasant and unassuming. I make it to Derby only 3 minutes late – and into the new island platform too! I’m now checked into the old Midland Hotel opposite the station and sorting out some work and pictures before nipping out for an hour to meet someone. Thanks to the power of social media a friend who lives here has realised that I’m in town, so for the second time in 4 days I’m meeting another of my Ride India friends, at the Railstaff awards I saw Katerina Deligianni, this time it’s Martin Ward. What a lovely evening in Derby, chatting about the industry with Martin and an ex-colleague of his who now works for WMT. Here’s a clue where we were. Now it’s back to the hotel for me as I have research to do and a busy day tomorrow. As my meetings in London aren’t till later I’ve deviated today and stopped off at the restored Wakefield Kirkgate station. Who would’ve thought a place I once dubbed tbe UK’s worst station would one day sport a cafe and a First Class lounge (thanks to Grand Central)? 11:32. Having taken the ‘scenic route’ via Sheffield and the Midland Main Line I’m now speeding towards Luton on mh way to the capital. I’ve been joined by two members of London Underground staff commuting into work. One from Kettering and the other Bedford! That’s quite a distance to come to work on the tube, but it does say something about how unaffordable housing in the capital has become. Right now I’m en-route to London aboard the first Grand Central train of the day from Halifax, the 07.08. Today it’s being worked by one of the ex-GWR Class 180s that transferred to GC after being displaced by the new Hitachi Class 800s. The GWR 180s aren’t bad but they need a little TLC and a refresh to bring them up to GC standards. Whatever type of set used, what remains unchanged is the friendliness of the GC staff running them. One of the beauties of being a regular traveller on a small company like GC is that you soon get to know the staff, some of the old hands have been with the company since it started the West Riding service from Bradford back in 2010. Now it’s time for me to sit back and enjoy the trip. I have coffee, porridge for breakfast and wifi, plus ever changing scenery outside the window. See you later! It’s been one of those days! I’m heading to London but the trip’s not been without hiccups. The day started well. Despite all the cars on our road being covered in frost the temperature seemed quite mild and my walk to the station was slip-free and pleasant. Halifax is quiet at 06:30, so there’s little to disturb your thoughts – which makes a nice change! The station was quieter than normal too, mainly because it’s another Northern Rail strike day, but as I was using Grand Central I wasn’t bothered. 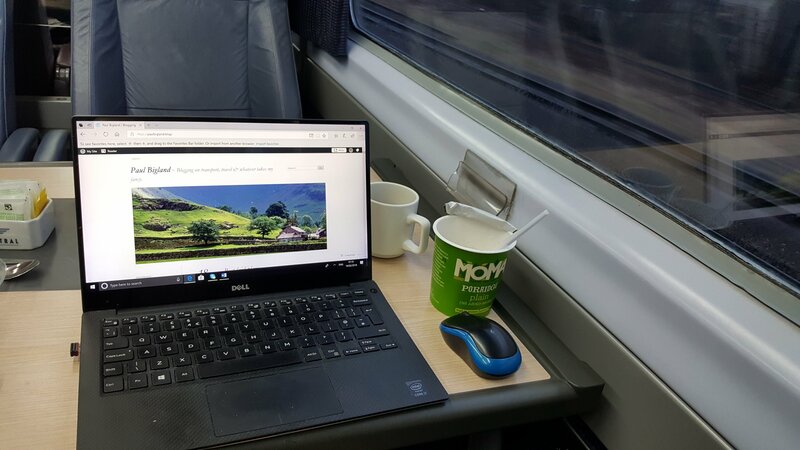 One of their ‘new’ ex-GWR sets arrived (on time) to take me South but my plans were immediately thrown into confusion as the wifi was up the spout. I normally use trains as mobile offices as much as anything else and factor in wifi as a vital part of the service. However, every cloud has a silver lining, so not being glued to my laptop screen meant I could savour the view from the window. Yorkshire looked beautiful. The landscape was covered in thick frost, lakes were frozen and a sense of stillness was palpable. To cap it off the sunrise through a cloudless sky was sublime, it illuminated the contrails of a gaggle of airliners all heading East towards Europe, leaving me wondering where each one was actually heading for. Sadly, the experience was marred when I got to Doncaster as a cab fault led to my train being cancelled! Grand Central did their best to provide an alternative by arranging for a Sunderland – Kings Cross service running 10 mins behind us to stop & scoop everyone up but I decided to wait for an hour and catch the next Southbound Bradford. My unexpected break gave me time to use the station internet access which was just as well as the 08:31 was another former GWR 180 without wifi! I’m currently enjoying the hospitality of Grand Central trains as I’m on my way to London for a couple of days. I’ve a job photographing some new trains on a franchise that was announced to be changing hands today! Stagecoach have run the SouthWest Trains franchise since February 1996, making it the longest running UK rail franchise. It’ll come to an end in August when a joint venture between First Group and MTR take over. The SWT franchise is a good indicator of how rail traffic has grown. When it started, their trains were carrying 108 million passengers a year. Today, that figure is over 230 million! As is common in new franchise deals nowadays lots of new trains are in the pipeline. This time it’s going to be 750 new vehicles (90 ten or five car trains.) as well as 18 refurbished and re-tractioned 5-car Class 442s for Portsmouth services. I can’t help cracking a wry smile at the news. After all, those opposing Hs2 always insisted that the project was sucking up all the money from the existing network! I saw further signs of that investment on the Journey from Halifax. There are grand plans to completely rebuild the station with an extra platform, demolish the existing station buildings and entrance and transform it into a major transport interchange. Meanwhile, Network Rail and its contractors have been busy trackside. Track’s been renewed at the West end of the station and there’s more evidence of progress on the resignalling scheme. New concrete cable troughing is appearing all over the place – along with a new trackside depot at Greetland Junction, complete with hardstands for RRV’s to access the track. Lineside trees have been cleared in many places, opening up a railway which was getting quite overgrown in some places. I’ll look forward to reporting on progress over the next few months.